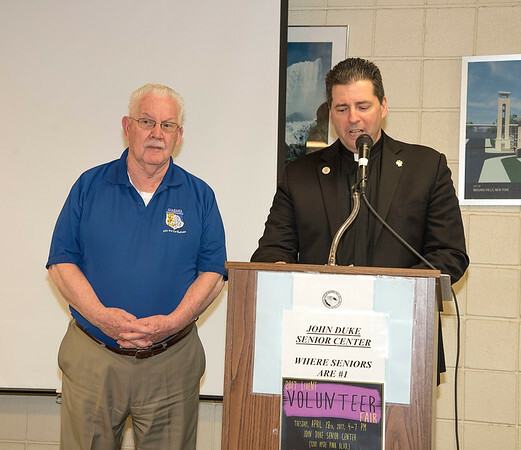 Niagara Falls, NY - Niagara University's Father James Maher named Niagara PAL Executive Director Art Eberhart as the first inductee to the 2017 Class of the Niagara Falls Volunteer Hall of Fame. The 3rd Annual LiveNF Volunteer Fair will be held on Tuesday, April 18. The event connects local residents interested in civic engagement with volunteer-driven organizations doing good work in the Niagara Falls community. During a brief ceremony at 4pm, Congressman Higgins, Fr. Maher and Mayor Dyster will announce the first inductees into the Volunteer Hall of Fame. The LiveNF Volunteer Fair runs from 4:00 – 7:00pm. Volunteer Hall of Fame Inductees will be announced during a brief program at 4pm. Members of the community were invited to nominate individuals who have made a significant impact on the lives of others through a lifetime commitment to community service. Eligibility is extended to City of Niagara Falls residents who have a minimum of 15 years of community service. More information on the 2017 LiveNF Volunteer Fair is available at http://levesqueinstitute.niagara.edu/programs/renu-niagara/livenf-volunteer-fair/.